Directed by Jim Morris, I have recently watched this Thrilling adaptation based on the exciting series of Barsoom novels by Edgar Rice Burroughs. It stars Taylor Kitch as a former confederate captain named John Carter who gets captured by the US Army during the American Civil war and after eventually managing to escape he hides out in a mysterious cave with strange spider-like markings etched on the walls and finds himself inexplicably transported to the planet of Barsoom (Mars). Far from being the dead planet he imagined, he discovers that it is inhabited by many different beings, including the barbaric Tharks who capture him and take him prisoner, however he manages to gain there respect by clobbering a few of them and makes a friend in one of them Tars Tarkas (Willem Dafoe). Who asks his rebellious daughter Sola and her pet Woolla to guard him, he tries to escape from the Tharks, However they recapture him but are interrupted by an aeriel battle between the neighbouring forces of Zodanga and Helium and John manages save one of the passengers from the Helium Vessel, who turns out to be the Princess of Helium, Deja Thoris (Lynn Collins) who tells him that the various beings on the planet are at war with each other and she is due to marry the war mongering Sab Than (Dominic West)from the neighbouring city of Zodanga in an effort to save the city of Helium from destruction (and she is not happy about it at all). American author and journalist Ernest Hemingway was born July 21, 1899. His economical and understated style had a strong influence on 20th-century fiction, while his life of adventure and his public image influenced later generations. Hemingway produced most of his work between the mid-1920s and the mid-1950s, and won the Nobel Prize in Literature in 1954. He published seven novels, six short story collections and two non-fiction works. Three novels, four collections of short stories and three non-fiction works were published posthumously. Many of these are considered classics of American literature. Hemingway was raised in Oak Park, Illinois. After high school he reported for a few months for The Kansas City Star, before leaving for the Italian front to enlist with the World War I ambulance drivers. In 1918, he was seriously wounded and returned home. 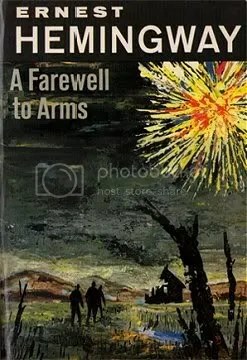 His wartime experiences formed the basis for his novel A Farewell to Arms. In 1922, he married Hadley Richardson, the first of his four wives. The couple moved to Paris, where he worked as a foreign correspondent, and fell under the influence of the modernist writers and artists of the 1920s “Lost Generation” expatriate community. The Sun Also Rises, Hemingway’s first novel, was published in 1926. After his 1927 divorce from Hadley Richardson, Hemingway married Pauline Pfeiffer. They divorced after he returned from the Spanish Civil War where he had acted as a journalist, and after which he wrote For Whom the Bell Tolls. Martha Gellhorn became his third wife in 1940. They separated when he met Mary Welsh in London during World War II; during which he was present at the Normandy Landings and liberation of Paris. Shortly after the publication of The Old Man and the Sea in 1952, Hemingway went on safari to Africa, where he was almost killed in two successive plane crashes that left him in pain or ill-health for much of the rest of his life. Hemingway had permanent residences in Key West, Florida, and Cuba during the 1930s and 1940s, but in 1959 he moved from Cuba to Ketchum, Idaho, where he committed suicide on July 2, 1961. Jim Martin, the Splendidly hirsute guitarist with American rock band Faith No More was Born 21st July 1961. Faith No More hail from San Francisco, California, and were regarded as one of the most influential metal/rock bands of the late 80s and early 90s, and credited for inventing alternative metal and as an influence on nu metal.It was formed originally as Faith No Man in 1981 by bassist Billy Gould, keyboardist Wade Worthington, vocalist M Morris, and drummer Mike Bordin.A year later when Worthington was replaced by keyboardist Roddy Bottum, who along with Gould and Bordin, formed Faith No More. After going through a series of singers which included Courtney Love, the band was joined by Chuck Mosley in 1983. The same year, Jim Martin was recruited to replace guitarist Mark Bowen. The band’s next album, 1992’s Angel Dust, was also highly successful and spawned the hit Midlife Crisis, , which became their sole #1 hit on the Modern Rock Tracks chart in their career. Angel Dust is widely considered to be one of the most influential albums of the 90’s. Faith No More however declined in popularity in the subsequent years. Longtime guitarist Jim Martin left the group in 1994 and was replaced by Mr. Bungleguitarist Trey Spruance. After the release of their next album, 1995’s King for a Day… Fool for a Lifetime, Spruance was replaced briefly by Dean Menta, who would eventually be replaced by their current guitarist Jon Hudson. After releasing one more album, Album of the Year, in 1997, Faith No More broke up in April 1998, and all members began work on side projects.